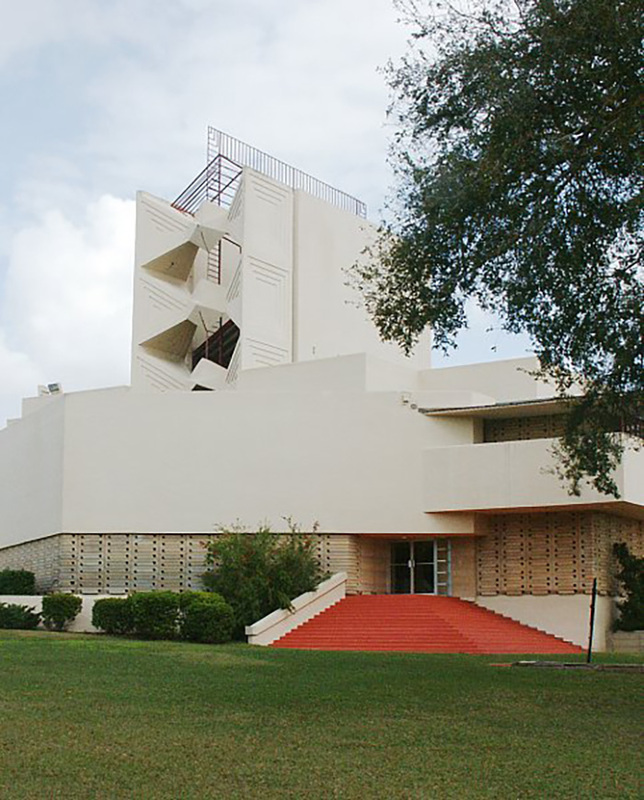 Annie Pfeiffer Chapel (1938-41) is the first and most prominent of the buildings Frank Lloyd Wright designed over a twenty year period for Florida Southern College. Wright and his client, college president Ludd Spivey, shared progressive ideas of education, democracy, nature and religion. Each expressed these in built form and in the activities of students ? architecture at Taliesin and at Florida Southern, and an experiential learning curriculum that included having students work on construction. For Wright, the use of geometry in design provided a connection to the underlying order, beauty, and complexity of nature. At the Chapel, Wright actively opposed traditional, simple rectilinear geometry ? axis and cross axis/transept, and instead developed a multi-directional, three dimensional organizing system based on thirty, sixty, and ninety degree angles. The geometry is translated into built form through an extraordinary use of reinforced concrete and its ability to cantilever, counterbalance, and span. The concrete also takes the shape of the formwork, both as decorative geometric relief, and as simple planes that create a play of light, shape and shadow in the bright Florida sun. The result is an exterior form and interior space of great power. The tower, or transformed steeple, is completely suspended over the center of the chapel and is transparent by the use of glass skylights, making a spatial connection up to the sky, and bringing active, dynamic light below into the collective gathering space of the college community.